Downbound the St. Marys River, July 27, 1983. At Collingwood Shipyards Ltd., Collingwood, ON, the keel was laid on September 27, 1978 for their hull # 217, a new self-unloader for Algoma Central Railway - Marine Division, Sault Ste. Marie, ON. Built at a cost of $23.6 million (Cdn) net of federal government subsidies, the new vessel was to be of a smaller size than the regular Seaway-sized ships of the day (730' 00" / 222.50m) to provide service to smaller Great Lakes ports which could not accommodate the larger vessels. The new "Nova Scotia" class self-unloader was given an ice strengthened hull and bulbous bow for winter and coastal service similar to that of her Seaway size fleetmate Algobay. 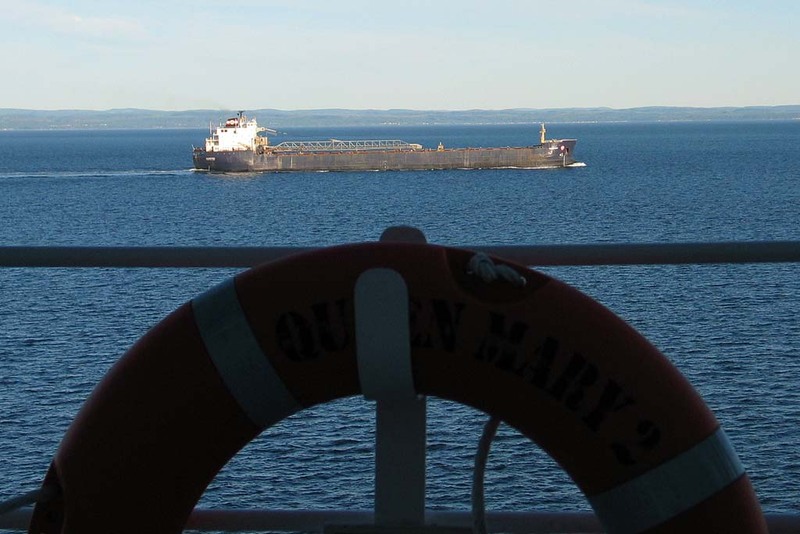 Algoma's intent was to have their new vessel see service on the Great Lakes, St. Lawrence Seaway, Gulf of St. Lawrence and the Canadian east coast. On May 7, 1979, Collingwood Shipyards launched their new build at a ceremony where the new vessel was christened Algoport by the new ship's sponsor Mrs. Henry R. Jackman, the wife of a former long-time Algoma Central board member. 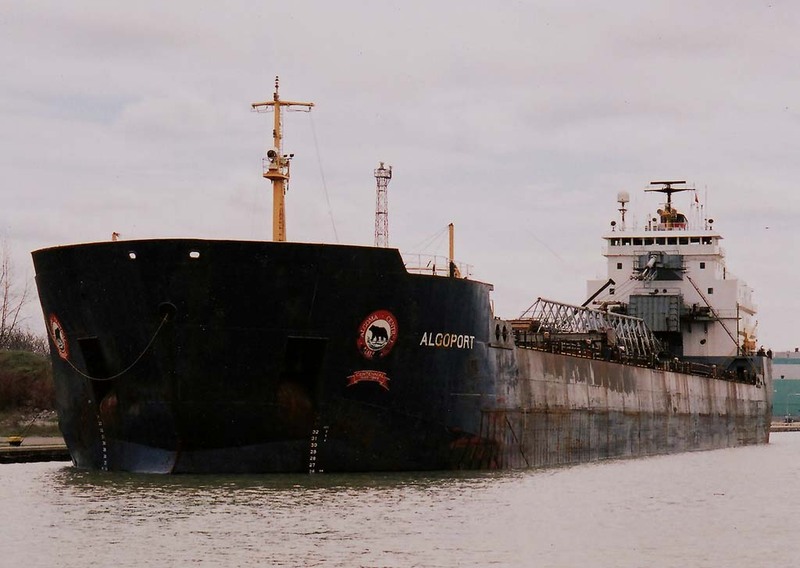 Although of similar appearance to the Algobay, due to her smaller size, Algoma considered the Algoport a "sister ship" by purpose and size to the Agawa Canyon, Algorail and Algoway. 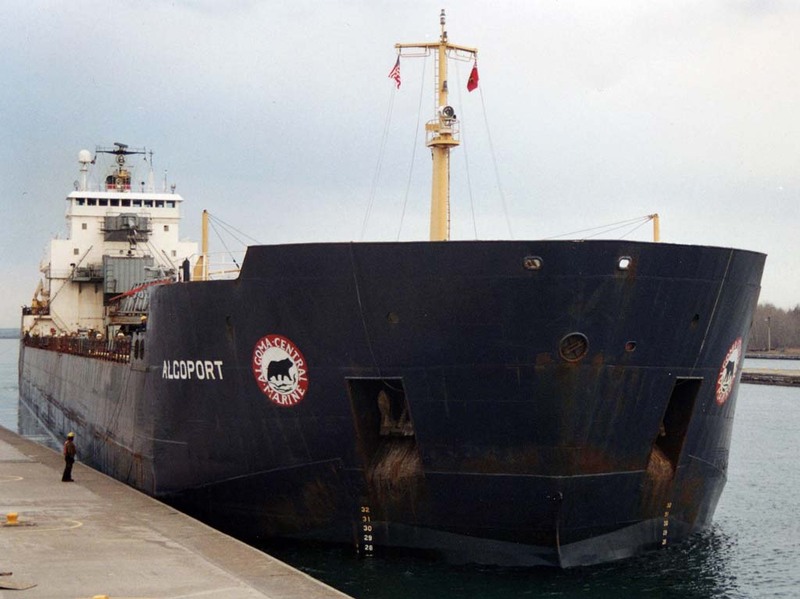 The Algoport name included the commonly used Algoma corporate ship prefix Algo" and the "port" suffix to honor the small city of Port Colborne, ON located at the Lake Erie entrance to the Welland Canal and home of the Algoma subsidiary Fraser Ship Repair. The Algoport was is powered by twin 5,350 b.h.p. Crossley Pielstick model 10PC 2V MK3 V-10 cylinder single acting, 4 stroke cycle diesel engines built by Crossley Premier Engines Ltd., Manchester, England burning intermediate grade 40 fuel oil. The power was fed to a single controllable pitch propeller giving her a rated service speed of 13.8 m.p.h.. The vessel was equipped with a 1,000 h.p. bow thruster. Nineteen hatches serviced 4 holds where the vessel was capable of carrying 32,000 tons at mid-summer draft. The Algoport's holds had the cubic capacity to carry 25,443 net tons of coal. Optimized for the gypsum trade, the vessel's self-unloading equipment consisted of a three-belt gravity fed system feeding a stern mounted loop belt elevator to a 261' 00" discharge boom that could be swung 90 degrees to port or starboard. This special slow moving self unloading system had a designed discharge rate of up to 3,750 tons per hour. 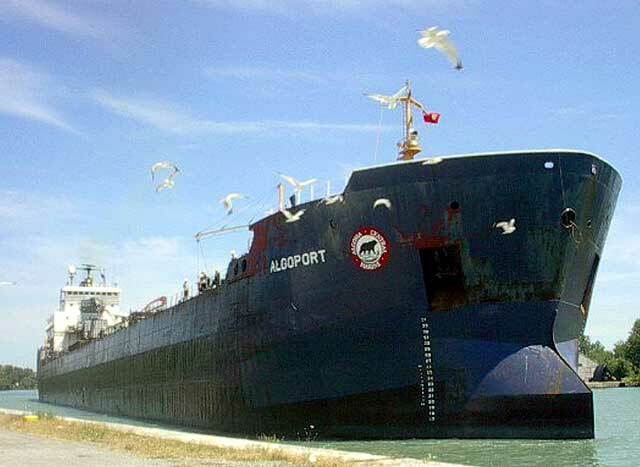 After completing sea trials on Georgian Bay in August 1979, the Algoport left Collingwood on her maiden voyage August 27, 1979 sailing in ballast to Calcite, MI for a load of limestone to Spragge, ON. That same year, on December 27 the Algoport had the honor of closing the Welland Canal for the season. The vessel grounded briefly on the Manistee River on August 9, 1980 with little or no damage. 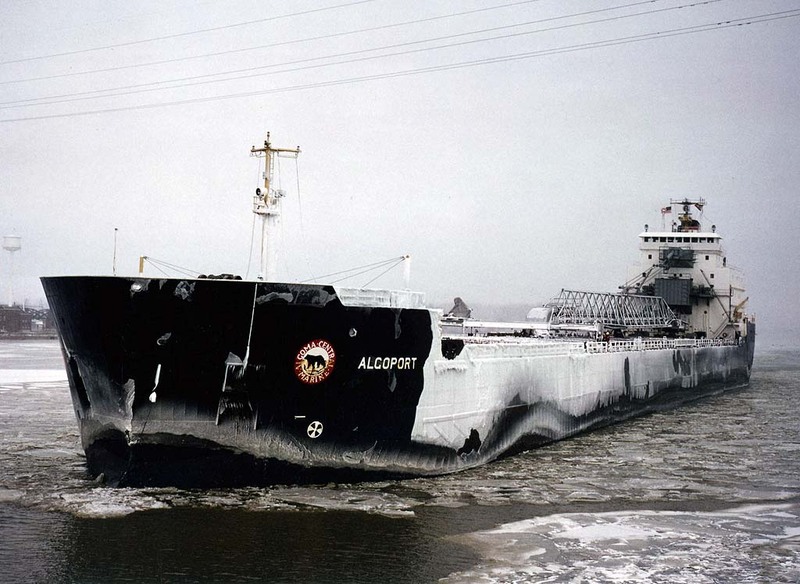 In 1981, the Algoport became the first vessel to load potash at Thunder Bay, ON taking on 19,091 tons in 15 hours. 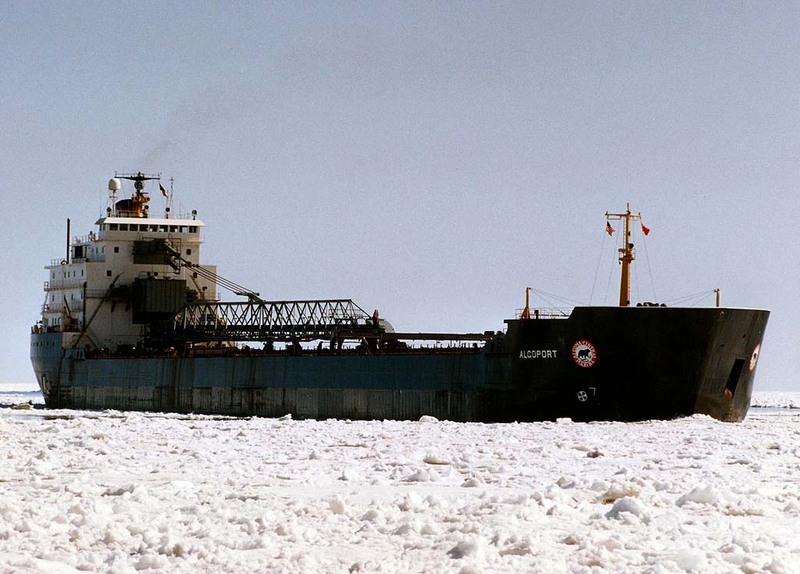 The self-unloader is noted to have opened Thunder Bay for the season on March 24, 1984 and again on April 1, 1986. 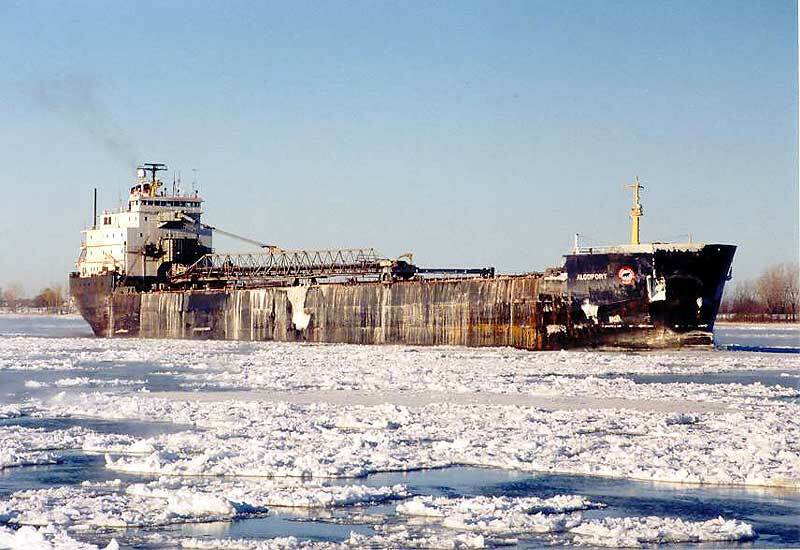 The vessel was then noted to have allided with the sea wall at Grand Haven, MI on April 21, 1986 while inbound with a load of salt. 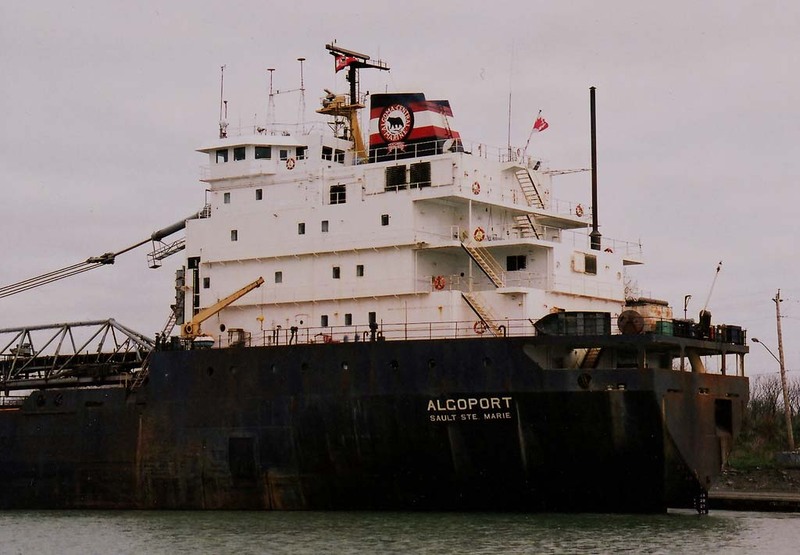 During the winter of 1991/92, the Algoport's engines were modified to burn the less expensive residual fuel consisting of a blend of bunker "C", marine diesel oil and heavy crude at an estimated cost of $1.3 million. 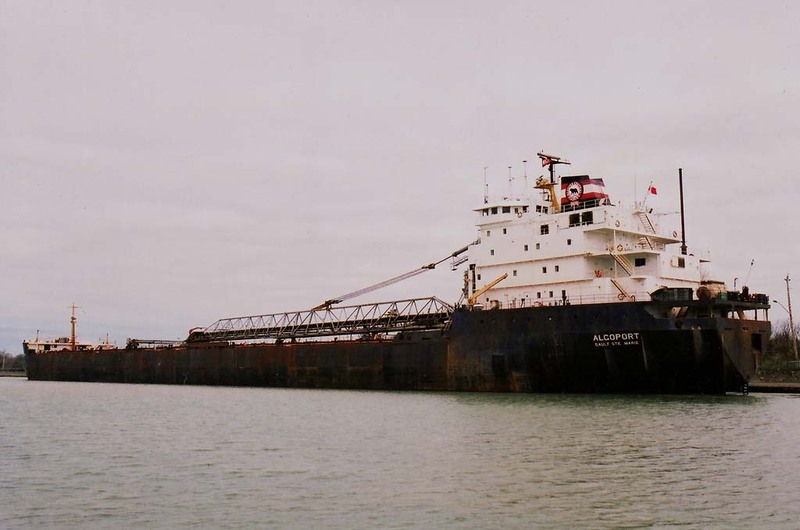 Beginning in 1993, the vessel with her self-unloading fleet mates commenced operating under the banner of the newly formed Seaway Self Unloaders, St. Catharines, ON, a pooling arrangement combining the self unloading fleets of Algoma Central Corporation and ULS Corporation (Upper Lakes Shipping). This arrangement was modified in January, 2000 when the bulkers of the two fleets (sailing under the Seaway Bulk Carriers banner) were merged combining all the vessels of both fleets into one operational partnership known as Seaway Marine Transport, St. Catharines, ON. 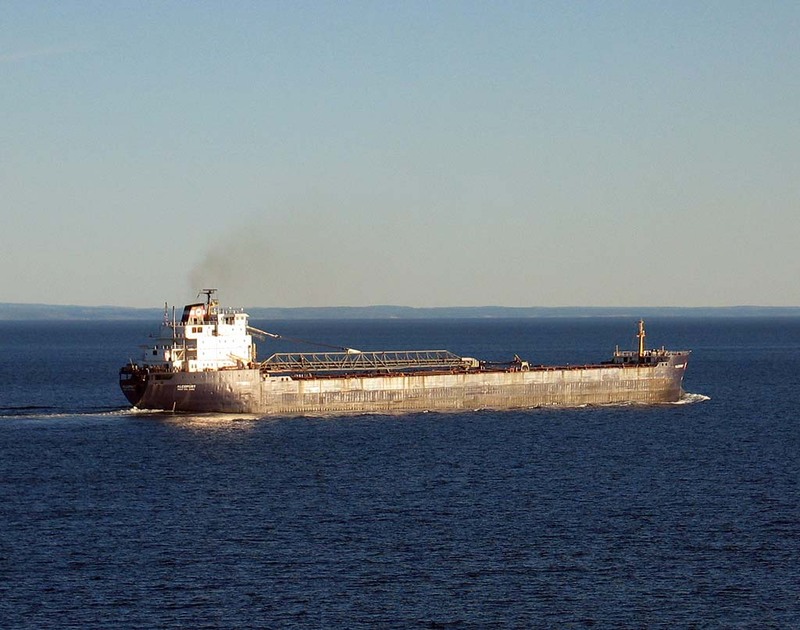 The partnership was further modified in 2004 when Seaway Marine Transport took over the complete operation and management of the Algoma and Upper Lakes domestic self unloading and bulker fleets. 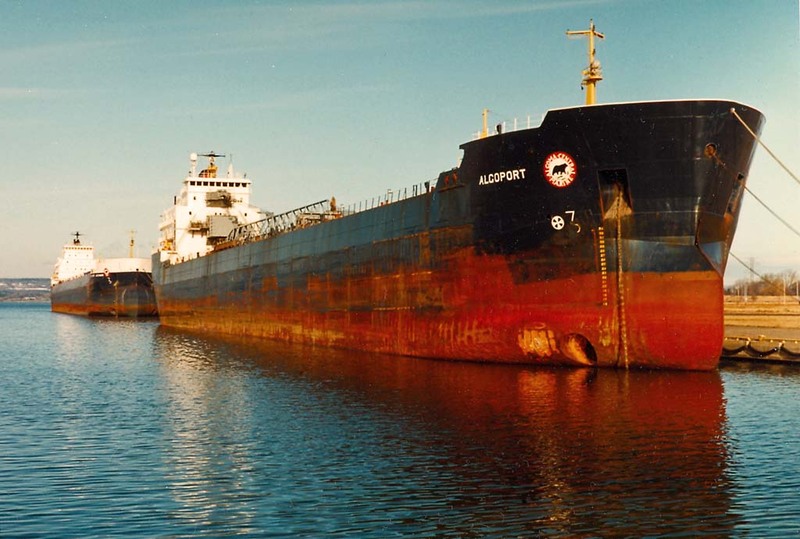 On October 9, 2001, the Algoport was reported aground at Iles de la Madeleine in the Gulf of St. Lawrence and was refloated the next day with no reported damage. Then on May 6, 2004, the vessel received hull damage while attempting to dock at the stone quarry at Stephenville, NL. Temporary repairs were made prior to loading and after delivering the load to Sept Isles, QC, she proceeded to Les Mechins, QC arriving May 12 for dry-docking to complete permanent repairs including a 5-year survey and inspection. After departing Les Mechins on June 11, the Algoport sailed to Lower Cove, NL to load. Later in 2004, on November 1, the self-unloader lost her port anchor about 650' from the Grand Entree Wharf at Iles de la Madeleine. While berthing at the Lafarge Cement dock at Clarkson, ON September 8, 2007, the vessel sustained a 2’ x 3" hole in the lower forepeak tank with ingress of water forward of the bow thruster. After unloading and damage inspection, she proceeded to Hamilton, ON arriving September 10 for repairs, returning to service 2 days later. From late 2007 on into 2009, the Algoport continued to have occasional but persistent issues with the ingress of water in areas of the forepeak and numbers 1 and 2 ballast tanks (as reported by Lloyd's Marine Investigation Unit November 2007, April 2008, November 2008 and June 2009). In 2007 Seaway Marine Transport announced that they had entered into agreements to construct two maximum Seaway size self-unloading forebodies and to attach these new forebodies to the refurbished aft ends of the Algoport and Algobay. The forebodies were to be constructed by Chengxi Shipyard Co. Ltd. in Jiangyin, China. The two vessels were expected to be in service by September 2010 and December 2009 respectively, at an expected cost of approximately $125 million. The Algoport remained operational into the 2009 navigation season and the Algobay had last operated in 2002 and remained laid up in Toronto, ON until being towed to Hamilton, ON in 2007 and then on to Montreal, QC where the overseas tow originated May 25, 2008 arriving at Jiangyin, China on September 10, 2008. 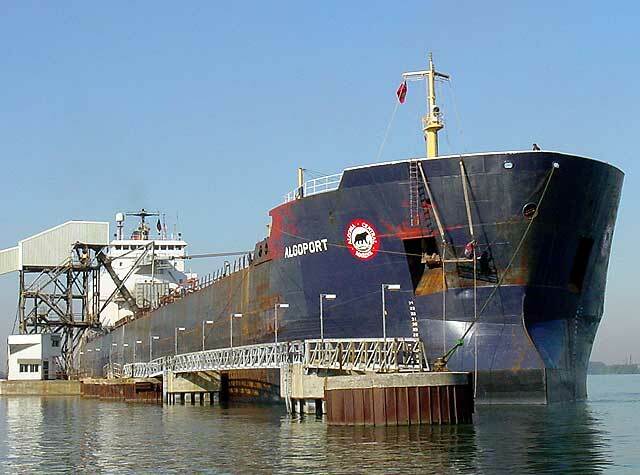 On April 3, 2009, the Algoport was drydocked at Seaway Marine & Industrial Inc. (formerly Port Weller Dry Docks) for hull strengthening and other necessary modifications to be completed for the upcoming voyage to China. As fate would have it, the Algoport loaded what would prove to be her final cargo on June 4, 2009 when the vessel arrived at Little Narrows, NS for a load of gypsum destined for Bowmanville, ON. After unloading at Bowmanville on June 10, she proceeded in ballast to Hamilton's Pier 10-4, arriving there later the same day. New bridge wings were added to meet Panama Canal transit requirements and other final preparations completed for her overseas voyage. On June 27, 2009, the Algoport departed Hamilton sailing under her own power for Balboa, Panama to await her tow to Jiangyin, China. She passed through the Panama Canal on July 19, 2009 anchoring about 8 miles south of Balboa to wait for the tug. On September 6, 2009 the Algoport broke in half and sank overnight in heavy seas while under tow of tug Pacific Hickory (formerly the Canadian registered Atlantic Hickory, renamed March, 2007). The tow had encountered some rough seas from Tropical Storm Dujuan that had passed near the vessel's route. The tow was about one week away from her destination when the Algoport sank in approximately 16,400' of water, location 30° 0' 0" N by 130° 0' 0" E (East China Sea south of Japan). The Pacific Hickory managed to release the tow wire before the vessel sank. There were no injuries, loss of life or environmental issues reported from the foundering. While the Algoport did have some fuel oil onboard to power its generators, the fuel is contained in the bunker tanks with all vents closed as a requirement of the tow. The tug reported that no signs of pollution or debris were evident after the vessel's sinking. 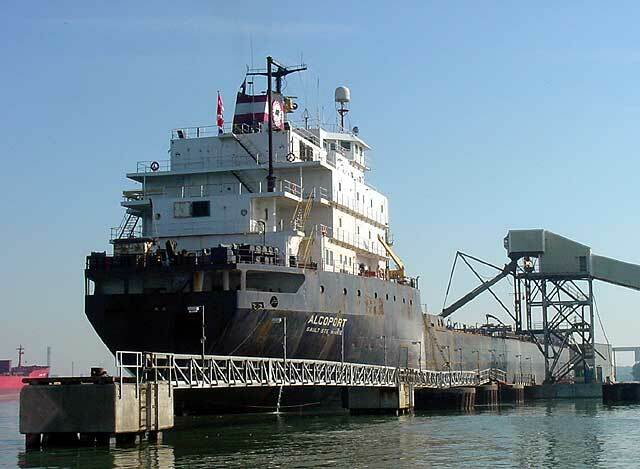 An official news release from Algoma Central on September 10, 2009 confirmed the loss and stated that insurance proceeds would be used to source an aft end to attach to the forebody under construction in China. Ready for launch, May 7, 1979. On the ways at Collingwood. Leaving for sea trials, Aug. 1979. Gulf of St. Lawrence, Sept. 1979. Downbound in the Rock Cut, Neebish Island, July 27, 1983. Upbound the Maumee River, Toledo, Dec. 1984. Winter lay up with the Capt. Henry Jackman at Hamilton, Dec. 18, 1992. Downbound the St. Clair River, Apr. 1993. Downbound the Welland Canal waiting for Lock 7 with salt from Goderich to Montreal, Apr. 20, 2002. Welland Canal, July 12, 2002. Loading salt at Windsor, July 14, 2002. Winter passage, Detroit River Jan. 14, 2003. Beautiful day off the Gaspe Coast, 2003. St. Lambert Lock near Montreal, Sept. 24, 2003. 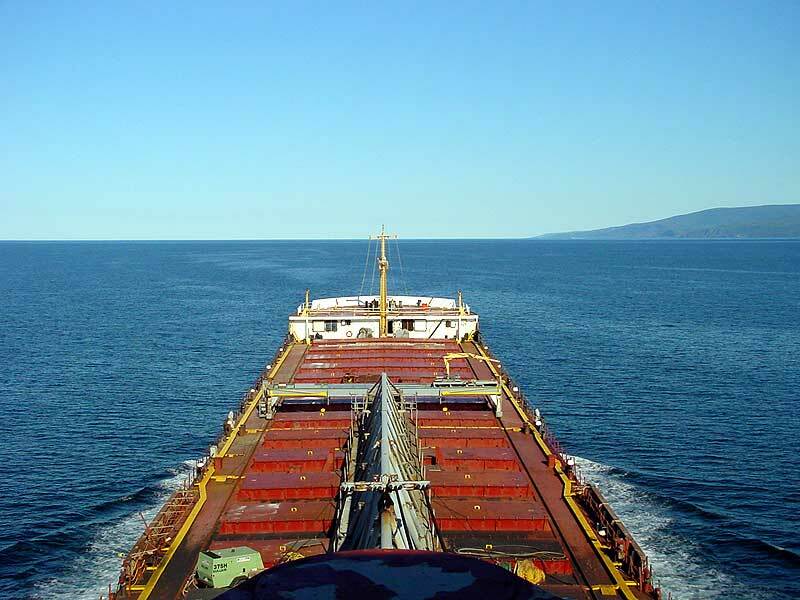 Below are images onboard the Algoport as they passed through an October, 2003 storm off the west end of Anticosti Island, where the St. Lawrence River meets the Gulf of St. Lawrence. The forecast called for 15 - 25 knot winds but mother nature surprised the forecasters and crew with winds reaching 45 - 55 knots sustained and gusts to 60 knots. As the ship ran for cover waves gradually increased, some even reaching about 35 feet. St. Lawrence River, Sept. 23, 2004 as seen from the Queen Mary II. Another view from the Queen Mary II. Wintering at Montreal, Feb. 18, 2005. St. Lawrence River from the Quebec Bridge at Quebec City, June 30, 2005. St. Lawrence Seaway, July 26, 2007. Downbound the St. Lawrence River from Wellesley Island, July 29, 2005. Winter lay up, Montreal, Feb. 2006. Downbound the St. Lawrence River in the 1000 Islands, July 5, 2007. St. Lawrence Seaway near St. Lambert Lock, Montreal, Oct. 4, 2007. Upbound S. Lawrence River at Mariatown with gypsum for Clarkson from Little Narrows, NS, May 29, 2008. Upbound the Welland Canal approaching Lock 1, Sept. 8, 2008. Winter lay up at Hamilton, Mar. 31, 2009. Downbound above Lock 3, Welland Canal bound for Port Weller and dry-docking, Apr. 3, 2009. With tug assistance, slowly turning into position to enter the drydock, Apr. 3, 2009. Tug Wyatt M working aft entering the drydock. Welland Canal at Port Weller, May 9, 2009. Downbound entering the St. Lawrence Seaway's Iroquois Lock, May 18, 2009. Hamilton's Pier 10, June 15, 2009. St. Lawrence River passing Mariatown, June 29, 2009. Entering the St. Lawrence Seaway's Iroquois Lock. Stern view departing the lock. Sailing down the St Lawrence River, at Trois-Rivieres to Balboa, Panama, June 30, 2009. Captain Clarence Vautier standing on the newly added bridge wing to enable Algoport transit the Panama canal, seen here from the pilot boat. at Trois-Rivieres, QC. Algoport is due to arrive at Balboa, Panama, July 13, 2009, crew will disembark July 15. Transiting the Panama Canal on July 19, 2009 heading for Balboa to await a tow to China. 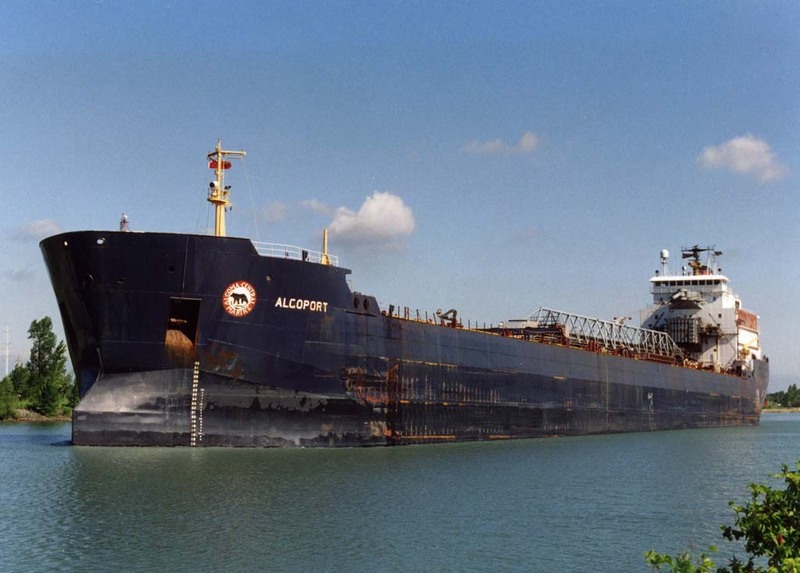 Photos & videos of the Algoport sinking, Sept. 6, 2009.